9 + = 15 Required Please enter the correct value. The Fed meeting today (Wednesday) continued to fuel discussions about when the U.S. Federal Reserve is going to finally raise interest rates. After all, labor market conditions had cleared up – at least by the Fed's metrics – ahead of today's conclusion of the two-day Federal Open Market Committee (FOMC) meeting. The economy added 295,000 jobs in February, and the unemployment rate sits at an impressive 5.5%. The Consumer Price Index has fallen three straight months – in November 2014 by 0.28%, in December 2014 by 0.33%, and in January 2014 by 0.68%. The Producer Price Index has fallen eight straight months. And economic indicators seem to suggest we're not pulling away from these deflationary numbers anytime soon. The U.S. Dollar trade-weighted index is at its highest levels in 11 years. It's up 6% on the year alone, and 15% in the last 12 months. Dollar strength seems to have no downside right now. Every major currency is falling against the greenback. The six currencies making up the U.S. dollar index are all in countries where interest rates are extremely low. The highest rates can be found in the U.K., at 0.5%. Three other currencies, the euro, the yen, and the Canadian dollar have more or less a zero interest rate policy (ZIRP). The remaining two, the Swedish krona and the Swiss franc, have negative interest rates. Rising interest rates will only add to these deflationary pressures. Here's how deflation, and further pressures from rising interest rates, will affect investments over several asset classes. Another Shift in Fedspeak – The Central Bank nixed the statement that it would remain "patient" on interest rates, but wrote that the change "does not indicate that the Committee has decided on the timing of the initial increase in the target range." Markets Like What They Heard – The Dow Jones Industrial Average had fallen 2.4% from its peak earlier this month in the weeks leading up to the Fed meeting. Today, the Dow had fallen another 152 points before the Fed statement. But after seeing the change in language, the Dow closed up 227 points. 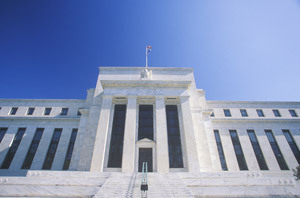 Commodities Rallied Across the Board – On the change in Fed language, a number of commodities began to fall. By 5:20 p.m. EDT, gold was up 1.6%, silver was up 2.7%, corn climbed 1.1%, and crude oil prices surged 3.5%. Treasury Yields Crashed – On the day, the yield on the 10-year Treasury fell 139 basis points, or 6.8%, to 1.92. The shorter-term, two-year yield cratered, falling 113 basis points, or 16.9%, to 0.557. Even the long-term, 30-year yield took a hit, falling 104 basis points to 2.512. As mentioned earlier, the dollar is climbing. While every major currency has been falling, the most dramatic currency moves are coming from the Eurozone and Japan. The European Central Bank just last week fired up the printing presses for an 18-month, 1.2 trillion euro bond-buying program. And in October 2014 the Bank of Japan accelerated its already aggressive program of asset purchases at a pace of as much as 80 trillion yen a year. In both cases, there's a direct opportunity to profit off these quantitative easing measures. They are going to stoke inflation in those economies and weaken currencies. Dollar parity is likely to come as early as 2016. That means there's still a chance to get in on at least 6.3% gains through the ProShares Short Euro (NYSE Arca: EUFX). This is an exchange-traded fund that shorts the euro. It's the same case with the yen. The current USD/JPY conversion rate is 120.85. Money Morning Chief Investment Strategist Keith Fitz-Gerald said that could shoot up to 200 in the next two years as BOJ QE and weak domestic demand ravage the yen. You can do that with the ProShares UltraShort Yen (NYSE Arca: YCS).